Alan Holley. 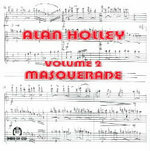 Volume 2 : masquerade. Borneo songs : for soprano and wind quintet / Alan Holley. Instrumentation: Soprano, flute, oboe, clarinet, horn, bassoon. First performance: 11 Sep 94. 13 Sep 2015: at A Portrait: Music of Alan Holley (Glebe Justice Centre). Featuring Taryn Srhoj, Sirius Chamber Ensemble.